Above the outdoor cafés of this city's trendiest suburb, some 60 exiles are busily dubbing Brazilian soap operas, Japanese cartoons and American music videos into Farsi. They work for GEM-TV, a privately owned, Dubai-based bootleg satellite station that beams the modern world into Iran from a broadcast station in Malaysia. This Southeast Asian nation is becoming, in the words of GEM-TV host Abed Rangamiz, "famous as a place to jump" from Iran's harshly religious regime. "It's the best of three countries that freely give us visas," Rangamiz says with a shrug. "The others are Turkey and Turkmenistan." The Iranian influx is small but growing fast. At present, there are about 60,000 Iranians, studying, working or waiting for visas in this relatively easygoing, multiethnic Muslim-majority country. 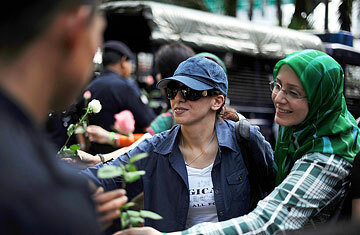 Iranians hold shares in an estimated 2,000 Malaysian businesses and occupy about 15,000 spots in Malaysian universities. Tourist arrivals from Iran jumped 14.3% to 116,000 last year. And, observe new arrivals, words of Persian origin, such as dewan for hall and anggur for grapes, have long been part of the Malay language. Most Iranians in Malaysia bask in the comforts of a life free from ideological pressures and from, in one exile's words, "bribing the police every time you want to have a party." Malaysia has become the base for frequent "Persian disco nights" and glitzy concerts by famed singers  in one performance earlier this year, during the Iranian New Year in March, there were singers calling for the overthrow of President Mahmoud Ahmadinejad; it was not part of the program. But life there isn't without hassles. Many, including Ali Manafi, a radio anchor who recently fled Iran at considerable risk, are exhausted by Malaysia's religious rules. "Spirituality should be personal," he says. "Here there are too many mosques and imams." Few Malaysian mosques welcome Shi'ite Muslims, leaving Iranian Shi'ites to worship at their embassy. Iranian activists have also faced rough treatment for political protests. Five Iranian student leaders were arrested for carrying candles in a memorial for protesters killed in Iran. In 2009, a protest of Iran's recent elections outside the U.N. building led to tear gas. However, most activists say they try to stay away from Malaysia's current unrests  though they are quietly pleased that the recent July 9 demonstration, in which 1,400 Malaysians were arrested, took place on the 12th anniversary of one of Iran's largest protests. Iranians say locals often assume the worst of their community. The highly publicized arrest of 15 Iranian drug smugglers last year  and several others since  hasn't helped. "Iranians are dirty-minded people  they come here to drink and take drugs and wear their shirts open like women," scoffed one Malay cab driver. Indeed, Ali Reza, an Iranian teacher, says he sometimes tells locals he hails from the invented country of Kerkovia to avoid discrimination. Of course, prejudice goes both ways. "We bring 2,500 years of culture, but here 100 years ago they were still in the trees with the monkeys," says GEM-TV's Rangamiz. Nafise Motlaq, a photojournalist who explains Malaysian culture to Iranians in a local magazine, Monograil, says mutual understanding will take time. "In Iran, we follow everything about the U.S. and Europe, but Asia is completely unknown. So people tend to isolate themselves here." She, for one, calls Malaysia "the closest I've found to a utopia." Moved by her seven years there, Motlaq published a photo book, A Given Path, about the rituals of Malaysia's three main ethnic communities  Chinese, Indian, Malay  with Marina Mahathir, daughter of Malaysia's former Prime Minister, writing the foreword. Siamak Rezvan, 40, has, like many Iranian professionals, started his own business, Yummy Restaurant, switching the menu from burgers to kebabs. He's working in Malaysia to put his 15-year-old son in an international school. Business is slow and his job applications were turned down because employers favor locals, but he's happy to be in Kuala Lumpur. "This is the place where we can have a normal life without fear," he says. However, Rangamiz, ever the exile, scoffs in his recording booth: "Malaysia my second home? Most of us, we don't even have a first home." Read about Malaysian Muslims and Christians arguing over the word Allah. See pictures of living in Malaysia's melting pot.